Now you can create professionally-made booklet publications in the comfort of your own shop/office, and keep the extra saving in your pocket. The BookletMac is fast and easy to use, allowing you to produce up to 800 booklets per hour and up to 60 pages each. The BookletMac gives you the option to fold and staple, fold only or staple only and side stapling is also available. 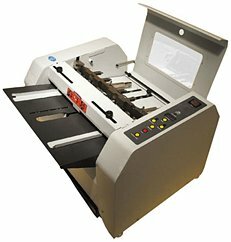 This machine is easy to operate, and there is no warm-up time, all the user has to do is simple insert the sheets and the machine will staple and fold it into a booklet within seconds. The precise built-in LCD counter gives you precise control of your job progress, and the clear window allows you to monitor the operation easily. This cost effective booklet maker is ideal for your office, school, church, or print shop. If you have any questions or are interested in purchasing the BookletMac, visit us at SpiralBinding.com. We have great pricing on a full line of Desktop Bookletmakers. Call us at 1-800-631-3572 for more information!